Key Difference: Both Greece and Rome are located in the Mediterranean. Where both these countries have numerous similarities in their socio-economic spheres, they always have many differences in their ways, which makes them unique. Where Greeks speak Greek, the Romans speak Latin. Athens developed through sea trade, whereas Rome grew by conquest. While Greeks were governed through democracy, the Romans were republicans. Below is a detailed analysis of these differences and many more which makes these great empires stand out in their own ways. The history of the ancient Romans and ancient Greek can be compared and contrasted using the economic, social and political aspects of the two countries. Athens developed through sea trade, whereas Rome grew by conquest. Greeks majorly exported olive oil and grapes while Romans common trade items were bronze and pottery. Realistic portraits were used for the purpose of decoration in Roman art while Greek art comprised of producing ideal artistic forms. Greece was associated with art better known as Venus de Milo while the Roman’s practiced Fresci, the mosaic or wall painting art (Robertson, 1969). 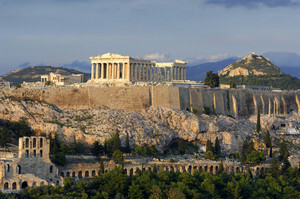 Romans had an upper hand over the Greeks when it came to buildings. They had concrete to build big better building unlike the Greeks. Arches and Domes characterized Roman architecture which Greeks didn’t use. Roman and Greek temples were almost identical but the incorporation of details like domes and vaults in roman architecture gave an essence of aestheticism to them. In Roman Empire women were given the status of citizens contrary to what was practised in Rome. The Greeks believed ladies to be gossipers and didn't enable them to own any property. They believed that women ought to be secluded and accompanied publicly and their main responsibility was to perform house hold chores, marry and bear children in contrast to Rome wherever women were valued for devotion, humility, peace, loyalty in marriage and had freedom of movement and could own property. In Roman family’s sons were subjected to their father contrary to Greek families where oiko, sons could challenge their father’s ability to run the family. 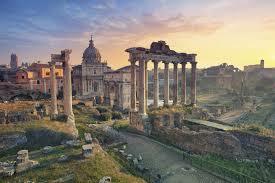 While Rome was an inland country on the banks of River Tiber, Greek cities neared water bodies. According to geographical positioning,most Greek cities were separated hilly country sides which made it difficult for immigrants and invaders to enter unlike Rome where their entry was very simple. The Greeks focused on life on earth and believed man would be judged on earth and his deeds both good and bad would follow him into afterlife while the Romans believed that one’s actions if proper and many would make one god in heaven. The Romans gods and goddesses were not characterized by action therefore not gender specific unlike the Greeks deities (Morford & Lenardon, 1999). The Greek were ruled by Athens between 500 and 300 BCE marked Greece’s Golden Age, whereas Rome’s golden age existed in the last century of the Republic and the first century or two of the Empire (Gill). The empire grew by conquest. Athens developed through sea trade. Were given the status of citizens. Sons were subjected to their father. Sons could challenge their father’s ability to run the family. Inland country on the banks of River Tiber. Rome kings were followed by a Republican government comprising of loyal blood senate and an assembly and later on emperors. Greeks were ruled by king just like Rome but later on by oligarchy, monarchies, tyrannies, and democratic government. Last century of the Republic and the first century or two of the empire.